» Rain tax sidelight: A little mystery? Rain tax sidelight: A little mystery? This storm drain was active on Labor Day, and I wondered how come. The campaign to prepare Albany ratepayers for a rain tax continues. I was reminded of the city’s plan for a “storm water utility” on Monday when I passed a storm drain from which flowed a thin but steady stream. The mystery: Where was that water coming from since it’s been days since we’ve had not a “storm” but a few summertime sprinkles. The last substantial rain in the mid-valley was on Aug.9, when the inch total recorded at the Hyslop Weather Station was 0.11, which ended up the total for all of August. Then, on Sept. 2 and 3, the station reported another 0.04 inch. So how could this pipe, which discharges into Cox Creek just before the creek reaches into Waverly Lake, still have that much water in it? As far as mysteries go, this one seems on the lame side, I know. But when you’re reporting on municipal developments like a “storm water utility fee,” you take what you can get. What developments? Well, the city has been stuffing water bills with notices explaining that the council, largely because of pending new state requirements, is considering a new “utility fee” to pay for taking care of its system of pipes and ditches that carry away the runoff when it rains. The plan is to adopt the new charge this fall and have it take effect next spring. For most households, it will amount to a few dollars a month. For the biggest property owners it may mean thousands. To explain further, the public works department is inviting the public to an open house from 5:30 to 7 on Tuesday, Sept. 13, at the Albany Senior Center. The proposed fee has all the earmarks of a city tax because the only way to escape it is to move out of town. But other cities already have similar charges, so escaping altogether may be tough. Unless you move outside the city limits, that is. 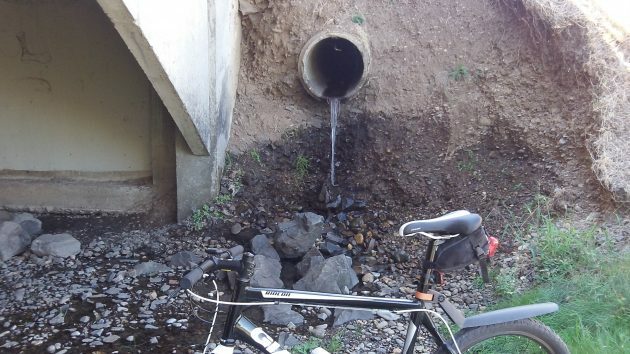 Rural areas don’t have elaborate systems of storm sewers. But for areas near the Albany city limits, Linn County is facing the same state requirements as Albany under a proposed new state permit for handling rainwater. Benton County has been covered for some time and also faces requirements under the proposed new permit. Still, Benton County has no rain tax, and Linn County Commissioner Roger Nyquist says Linn won’t have one either. “…but a few summertime sprinkles.” = Why is the water table so high in this area? Nice picture. Sewage? Water pipe in disrepair? Perhaps the City Fathers and Mothers should reconsider their ill-advised vote to ban recreational pot sales. Had they done so, they could have also passed the 3% local Pot Sales Tax, using those funds to lower or maybe even negate the proposed water runoff tax. Maybe someone was trying to grow concrete. How often have you seen sprinklers watering the sidewalk and street?